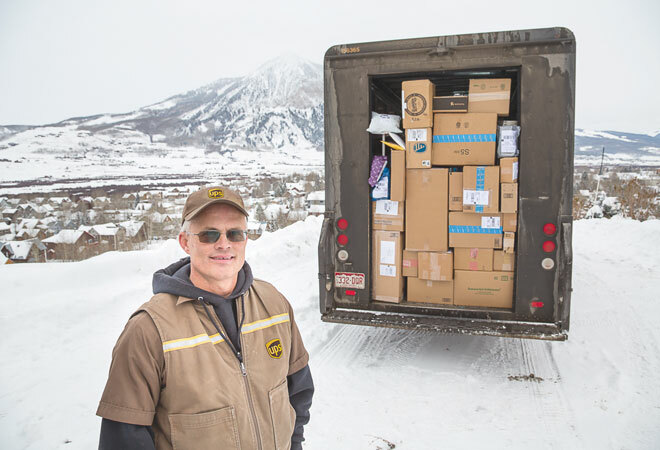 It takes an enormous sense of humor and well-honed patience to be in the delivery business this time of year, but UPS driver Craig Jackson revels in his job, and is renowned throughout town for skillful delivery of both packages and comic relief. For 18 Christmases and holidays, Craig has donned the brown uniform, zipping through streets, scrambling through traffic and alleys, and climbing over piles of snow to deliver boxes of all sizes with his smiling attitude intact. He is the closest thing we have to an old fashioned, door-to-door, small town mailman who knows the name of every dog and kid, where you went on vacation, and what’s in the plain brown wrapper he just dropped off at your business. “I see things that nobody else sees, like pole dancing in an old folks’ home,” the self-proclaimed comedian grins. But he admits that he’s never gotten up in front of an audience with his exquisite sense of humor, which was sharpened by his long solo days spent on the road juggling packages. Craig grew up in Grants, N.M., and went to high school in Albuquerque. “I had a great childhood. I wish my kids had my childhood. It was a pretty innocent time. The things we did would get you arrested today, or worse, outed on Facebook. As a kid, I was always in mischief.” To those who know Craig, this is no surprise. Craig recalled a time he and his buddies camped out on the roof of their high school library because, “It seemed like the thing to do that time, wake up, get out of your tent, and slide down a pipe from the second floor to class,” for which, he grins, they got a three-day vacation, but better to be seen and get suspended because, “What was the point if your classmates didn’t see you?” When he wasn’t pranking, Craig was shussing the slopes with his high school ski team, traveling to Taos and Santa Fe. He is married with four kids. “We met at a wedding. She was a bridesmaid, I was a groomsman,” Craig says of his wife, Alisha Eck, another agriculture economics major at Texas A&M, who also happened to have a boyfriend at the time. “That’s one in my column,” he chuckles. “It was one of those deals where being in the wedding party, we spent a lot of time together that weekend. My friend, who was getting married, told me I needed to ask her out, but her college roommate married my roommate and Alisha didn’t like my roommate so I didn’t like her,” which somehow made sense in a friendship-loyalty sort of way. It was a very good game and the couple married in 1996, in Boggstown, Ind. “She was a corn farmer’s daughter. I married the farmer’s daughter. It was before farmersonly.com. I found her on my own,” he hooted. They have four children, Bunk (the grandfather’s namesake) is 18; the twins are 15, Ellie (named after Ellie May Clampett because they were watching The Beverly Hillbillies right after her birth) and Molly (named after the most productive gold mine in Colorado, the Molly Kathleen in Cripple Creek); and the youngest is nine-year-old Cade, named after a TV commercial kid actor that they both thought was cute. “So much for originality,” Craig laughs. In 1997, Craig arrived on the Gunnison to fly fish—and never left. He started looking for a way to make a living here when the UPS position became available. It took no time at all to pack up his life and wife and move to Gunnison that same year with six-week-old Bunk in tow. And people are more than glad to see this man in brown, especially kids, because this time of the year, they know he’s bringing the goods. “We’re doing the best we can because we know how much it means to them. Oftentimes it’s an 11-hour day with snowstorms or snow piles and gobs of packages during holiday season. It’s like a paid workout; you just pile up as many boxes on the dolly and run from delivery to delivery. “I live in Doyleville, a gated community east of Gunnison,” he jokes about the barbed wire fences. “It gives our kids an opportunity to learn work ethic from raising animals. They’re 4-H and raise show lambs. We have wild donkeys that we pack in the summer for camping. We have our own small army of chickens for meat and eggs, four horses, two burros, and three dogs. We have a love for the mountains and open space here and we love to camp together. We ride horses, we ski, and just spend time together sitting at our kitchen table laughing and joking,” he says. The warmness in his voice and big smile on Craig’s face tells he’s found his perfect life. He may not have reindeer, but when that big brown truck pulls up, you know you’re going to get just as excited as hearing click-click-click up on the rooftop. And he probably wouldn’t say no to milk and cookies, either.